Who do you think is the most popular boy band or girl band in Singapore? Take a minute and pick one, then we can explore and converse about how their social media strategies are implemented well and help them to be successful in the Singapore pop music scene. Please leave a comment about a group that you think is popular and why in the conversation thread to this posting. Thanks and see you in class. In many aspects, Corporate Social Responsibility – CSR – activities have become an integral part of marketing. Examples abound: Body Shop is synonymous with eco-friendliness and appreciated as a “good” brand because it frowns on animal testing; Starbucks enjoys its liberal image via its social-contribution projects benefiting local communities, culture, the arts, and the environment. The list goes on and on, showing that corporate social contribution is widespread. On the other hand, fundamental questions ride alongside: What side effects are there or will there be? Will these social contribution activities help raise brand value? Will consumers accept the social contribution of a “bad company”? If an oil giant causes an environmental disaster by oil spill then later trumpets its environmental protection campaigns as social contribution, how would communities and customers respond? This study measures changes in customers’ perceptions of social contribution activities according to firms’ various situations. First, based on existing research, I assumed that three factors – i) the corporation’s reputation, ii) the extent of the crisis to be solved, and iii) the corporation’s preemptive efforts for the social contribution – affect communities’ and customers’ perceptions of hypocrisy. Then, that in mind, I examined the influence of each of those three factors via experiment manipulation. The experiments indicate that consumers tend to perceive the corporate social contribution to be more hypocritical, that is, as an unfaithful-money act, reducing its corporate reputation and increasing the perception of how big a crisis the company is in. More: that hypocrisy perception is found to affect (of course most negatively) communities’ and customers’ attitude’ towards the corporation. Such results carry a distinct message: corporations should see crystal-clearly that social contribution activities themselves are no guarantee – let me emphasize that: are absolutely zero offset – against a rapid 180-degree reversal in corporate image. In fact, the hypocrisy perception immediately brings into play the possibility (maybe the probability) of a negative image of the corporation. In crisis mode, consumers do not judge corporate morality by a yardstick of corporate social contribution. They judge it by the circumstances of the crisis and by their perception of the company’s intention. Please note the sophistication here, (which, alas, corporations too often do not realize consumers possess): although, say two corporations each have achieved closely-similar results from their social contribution activities, consumers’ perceptions can and will show a world of difference based on the reputation, conduct and responses of those two corporations. Such study results are interesting in that they imply we judge corporate behaviors and individual human behaviors by similar moral standards. From the ethical viewpoint we judge behavior based on two criteria, one of which is the act’s outcome. According to utilitarian ethics, this is an attitude that recognizes and praises the action as having developed society if its outcomes are positive regardless of its intention. The other criterion is a categorical ethic that Kant claimed, according to which we should look beyond outcomes, to intention. If an act’s intention is to covet one’s own benefits, it cannot be said to be a genuinely good deed; rather it is condemnable for its greed-based hypocrisy. As ‘good company’ marketing is recently fashionable, these findings imply what corporations should have in the forefronts of their collective in-house minds when developing their social contribution activities. First: understand the ethical tendency/ies of target consumers. In formal terms: Know Thy Target. Second: when corporate reputation dips below stellar; or the corporate situation is near crisis mode or already has entered it, social contribution activities’ intentions easily can be suspected irrespective of their real motive. To extend those formal terms: Know Thy Target. And Tread Warily. Warily? Well, yes, and in many ways. For instance, try a sensitive and quiet promotion rather than massive and trumpeted. Identify possible side effects and work to minimize them. Think compensation and think genuine when thinking social contribution. Also do the necessary homework, by bringing to the table some (three or four is a good number) thorough case-studies of reasonably-recent previous corporate-caused major disasters and how responses to those backfired and worsened matters and/or were mitigated and earned respect. Hint: don’t simply read those case-studies. Instead, bring the actual case-studier and writer to the table, the actual-, in-depth-, real-, genuine specialist. This is a good read that helps your understanding about social media history covered in Week4. “Social media is a valuable tool not only to identify issues and key stakeholders on a project but also to enhance public participation thereby create positive and solid relationship with them”, said Penny Townley of Penny Townley’s Environment Services. Throughout her extremely valuable lecture, Ms. Townley shared her more than three decades of experience in the field as an executive leader in communication. Amongst other aspects she outlined major frameworks for stakeholder engagement models applicable to various projects including the International Association for Public Participation Spectrum. She explained and discussed how social media development has facilitated two-way engagement with key stakeholders. And – along with key guiding principles and frameworks – she elaborated on the role of social media in not only engaging the public, but also reflecting their voice, in the many infrastructure projects occurring such as Australia’s Sydney Metro, Northwest Rail Link and Barangaroo. Ms Townley focuses on the key value of social media, especially in building understanding about the value of the project, as a listening post and educative communication tool, and in tackling the severity of crisis via social media trending during the disaster. Ms. Townley’s work spans infrastructure, environment, planning, education, health, social and professional services, etc. She contributes to the industry’s professional standards and is one of six authors of Valuing Better Engagement, the Consult Australia guide to tendering for engagement services (published December 2013). COMM346 appreciates Penny Townley’s wonderful and generous guest lecture, and with it her sparkling enthusiasm for, and warmth towards young future professionals in academics! So, in relation to the sample research proposal from the previous students’ work that I shared with class a couple of days ago, unexpected events occur that can change the game IF competitors’ advisors or researchers or project whiz-kids are alert and can sense advantage. As it happens last week, Starbucks has become embroiled in a massive row over a major change to its Rewards program (announced Feb 22-23), with many long-standing Starbucks clients now extremely unhappy about the change, and saying so very publicly on social media and directly to the print media. Many of the complaints include the promise/threat to break away from Starbucks and never return. Because CBTL probably could reap benefit from this or have some lesson to be learnt, right, this would be an additional consideration or factor in the project analysis and planning for Coffee Bean (vs. Starbucks). The underlying logic is; once any policy change is announced people tend to strongly eager to hold on to what they’ve got or enjoyed so far rather than focusing on new benefits retained by the change. Hence, it is indicated that generous offers for the first round of social marketing to rapidly garner ppl’s attention or to raise awareness might backfire (or complainers’ voices are over-represented) at the end when you have to take it back. What is your thoughts on this case? What could be done for Starbucks to relieve the reactance? Thank you, Zhong, for your valuable opinion! So we notice that 2008 was the tipping point for Facebook diffusion, which eventually disrupted all social media platforms which until then had been local-market leaders. While I do not claim extensive expertise on Friendster, I do believe the reason behind “Facebook success vs. Friendster failure” rests mainly in cultural factors. As I mentioned in class, Facebook started as a US-college culture, then easily and quickly penetrated the general population … Many reasons for this, one being that it originated in that iconic homeland of the collective mind: Harvard! Other reasons are that Facebook has become the benchmark standard of a widely-used social media platform providing general users the combination of “easiness, simplicity, openness, and connectedness (or sense of being connected) to the global network.” Another directly-relevant indication that Facebook itself has become the “community norm based on the global standard” is that EACH and EVERY member of OUR class has his/her own Facebook account! In sum, many concepts/theories we covered in class explain the Facebook dominance in local markets and why and how it deepens. Think, for instance: Network effect/ bandwagon effect; cultural imperialism (Western media/content tends to look superior to Eastern media/content, e.g., Hollywood); diffusion innovation; open API (Yes! Facebook leveraged on openness – many people easily could migrate to Facebook via their Gmail accounts…); ubiquitous mobile technology; etc … Since 2007/2008, all these factors widened Facebook’s user population into older/more general/more global sectors, right? Here is good news I’d like to share about Group 4 and lululemon athletica Singapore. Group 4’s pitch of social media campaign strategy to lululemon was very well-received by the company, which is interested in taking up and implementing some of the group’s ideas into their new online & offline dynamics! 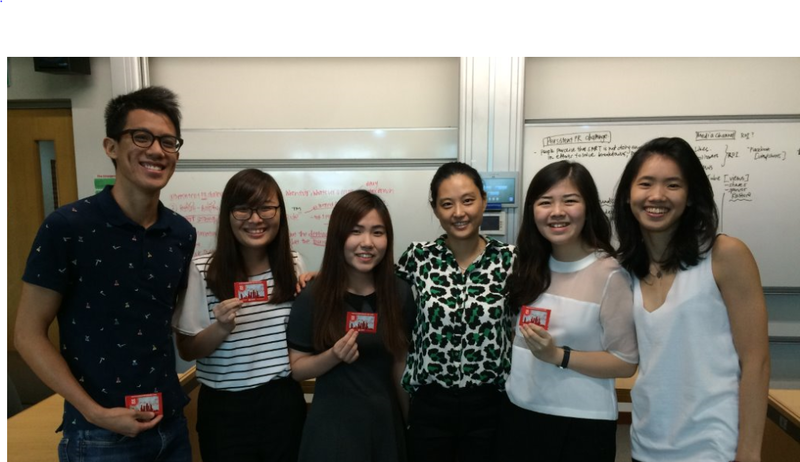 Group 4, as you know, is Sarah Widjaja, Geraldine Ong, Jun Kai, Fung Yun Shan, and Chin Wen Alyssa. It so happens that recently (during the past two years), lululemon has come to mind in several interesting and valuable interdisciplinary aspects globally (not only Singapore). One of these – generating extensive commentary on social media – was the infamous thigh-gap uproar: in a media interview, an at-that-time lululemon executive said that women without thigh gaps should not be wearing lululemon leggings; social media came alive with comments such as “the between-the-ears-gap is the real issue here, not the thigh-gap.” Another was related publicity of a scholarly-journal article with the smart title ‘Enclothed Cognition’ indicating that what one wears has a measurable effect on what one does, and implying it also affects how often and how thoroughly one does it, in other words, wearing particular types of gym clothing causes one to want to wear such clothes more often, go to the gym more frequently, and try harder when there (vide Adam, H. and Galinsky, A., Journal of Experimental Social Psychology Vol 48, No 4, July 2012, pp 918–925). Many thanks, everyone. I wish you all enjoyable holidays. Please share any good news regarding landing jobs or internships, or exchange- and overseas-travel experiences and such. See you around campus next semester! Patrick Nathan is a Vice President of Singapore Mass Rapid Transit – SMRT, heading its Corporate Information and Communications Division (which includes Corporate Marketing and Communications, Passenger Service Department, and SMRT’s interestingly-named Information Fusion Centre). On October 22 he was Guest Lecturer in the social media ROI module in COMM 346 Social Media Strategies. He was accompanied by his SMRT Corporate Communication colleague Jean Pham Ai Ling. 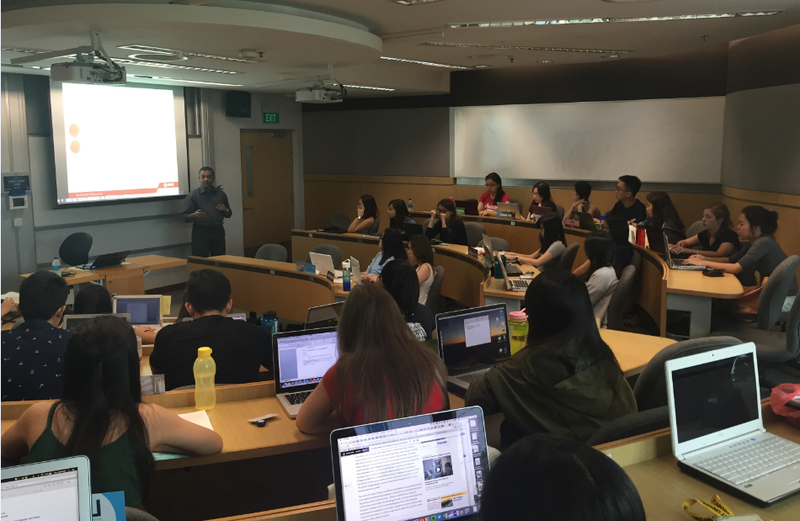 In his lecture, Vice President Nathan introduced SMRT’s social media use for developing an effective PR Strategy and building public confidence. More specifically, he discussed and explained how the collective new media platform (it includes Corp intranet, mobile apps, the SMRT blog and other social networking sites) streamline SMRT’s strategy to build and operate customer engagement, awareness, education, and incident management. Regarding this year’s July 7 rail service disruption, which had extensive spillover impact on Singapore generally, V-P Nathan said that “for better community outreach” SMRT discussed “on broadcast platforms” various aspects about it and, importantly, about “taking responsibility, apologizing for the inconvenience, and explaining what went wrong, steps taken to rectify the fault and service recovery measures.” In these ways, he said, SMRT “did its best to demonstrate accountability, sincerity and transparency.” He also elaborated on how SMRT measures and evaluates the effectiveness of social media, mainly via two aspects: outreach and engagement. Group 2’s resultant pitch with its eye-catching catchphrase of The Right Ride – conveying the idea of an excellent customer experience for commuters and users of SMRT services – was evaluated highly by V-P Nathan and Jean Pham Ai Ling, and won the idea-pitch competition. As a winning team, the group was awarded small prizes. 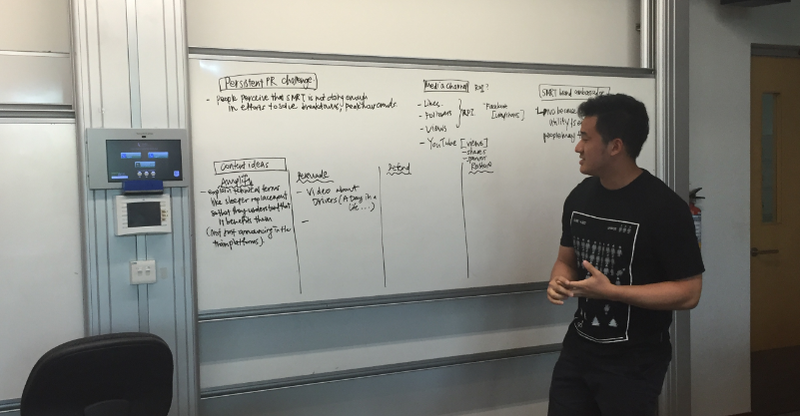 Group 2 has achieved an impressive hat trick: three idea-pitch wins in a row – MBS, Uber, and SMRT. COMM 346 very sincerely appreciates SMRT for its informative and educational presentation and workshop activity for the class. We in COMM 346 hope to continue this industrial-educational conversation for future modules. Faculty additional note: Patrick Nathan also brought into our COMM 346 Guest Lecture session the clear benefit and prestige of his substantial academic credentials, and his impressive Public Service track record. He has a Bachelor of Social Science (Honours) in Political Science (National University of Singapore) and a Master of Science in Strategic Studies (Nanyang Technological University). He served on Singapore’s National Security Secretariat 2002-2004, then was seconded to the National Security Coordination Centre, Prime Minister’s Office, as its Deputy Director, until 2011 when he joined SMRT. 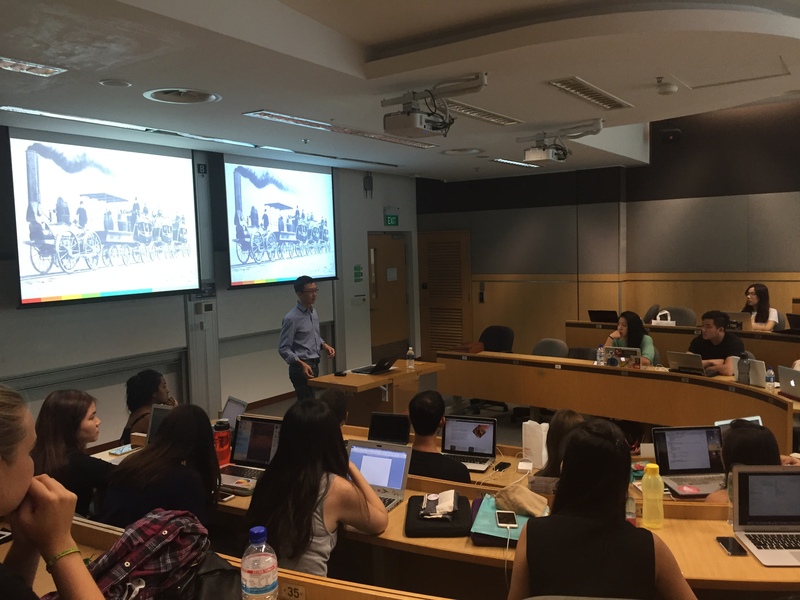 APCO’s Steve Liew – in his continuing policy and strategy advice to UBER’s operations in Singapore– speaks at COMM 346. APCO Worldwide1 Executive Director Steven Liew spoke on Uber’s strategic message plan to deal effectively with government relations, and to protect the legitimacy of its (i.e., Uber’s) business, against hostility. 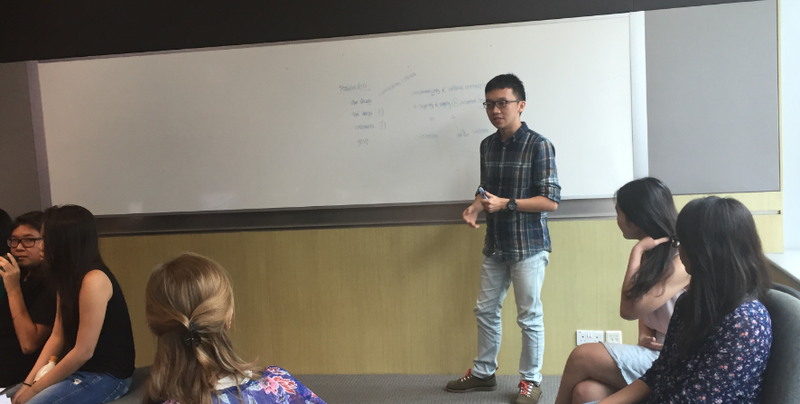 Mr. Liew discussed the conflict between Uber, on one hand, and the Singapore taxi industry, on the other. Basically, each Singapore taxi driver is required to have a vocational licence, whereas Uber drivers do not need such a vocational licence. Taxi drivers say that while competition itself is fine, it is unfair that their main competitors, namely Uber drivers, are not required to have the same vocational licence. Obtaining the vocational licence requires proving knowledge of road safety and related issues, and if taxi drivers must do so, Uber drivers also must. 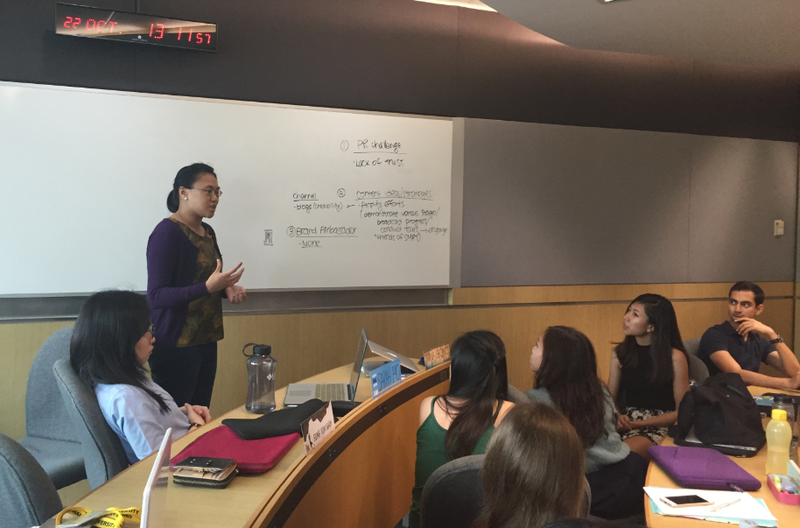 Mr. Liew then proposed to COMM 346 students a challenging assignment: What good way can this matter be handled? In response to Mr. Liew’s stimulating challenge, students competed with fresh ideas highlighting various aspects of Uber, one of which is that Uber creates jobs for breadwinners, and that they provide efficient and convenient rides for all Singaporeans. Each group pitched diverse ideas, encouraging as many people as possible to share their experience with Uber, and portraying Uber as a life-changing platform for fast revenue generation etc. Cherie Lim Ying, Group 5, proposed to Mr. Liew that the difference in road safety and road knowledge between taxi drivers and Uber drivers could be bridged by online job training for Uber drivers (who would have to go through related courses and assessments). This would increase Uber-driver eligibility to be on the same level of skills and knowledge as the taxi drivers. With its workshop ideas pitch, Group 2 is prize-winner (second time consecutively)! Mr. Liew’s excellent lecture presentation was about the history of disruptive technology, opportunities and challenges in a sharing economy industry like Uber. He also gave a rich description of how Uber embarked on working with regulators, managing pressing issues, in addition to the role of social media in creating awareness and engaging stakeholders. 1 APCO Worldwide is a global public affairs and strategic communications consultancy.